Earlier this year the £11 billion deal to merge fund management giants Aberdeen Asset Management and Standard Life resulted in the creation of the UK’s largest and Europe’s 2nd largest fund manager with combined funds under-management, at the time of the merger, exceeding £670 billion. Now known as Standard Life Aberdeen, the merger has resulted in major internal restructuring with job cuts expected for over 800 people as they bid "to maximise operational efficiencies and cost synergies". Martin Gilbert, Chief Executive of Standard Life Aberdeen, has stated that “The merger deepens and broadens our investment capabilities, and gives us a stronger and more diverse range of investment management skills as well as significant scale across asset classes and geographies. We believe this will enable us to deliver an even better proposition and service to our enlarged client base." However, on the outside, little has changed for investors as the extensive range of Standard Life and Aberdeen funds that were available before the merger remain unchanged. But investors have been leaving Standard Life Aberdeen in their droves amid reports of poor fund performance, with net outflows of £23 billion reported in the 9 months up to September 30. 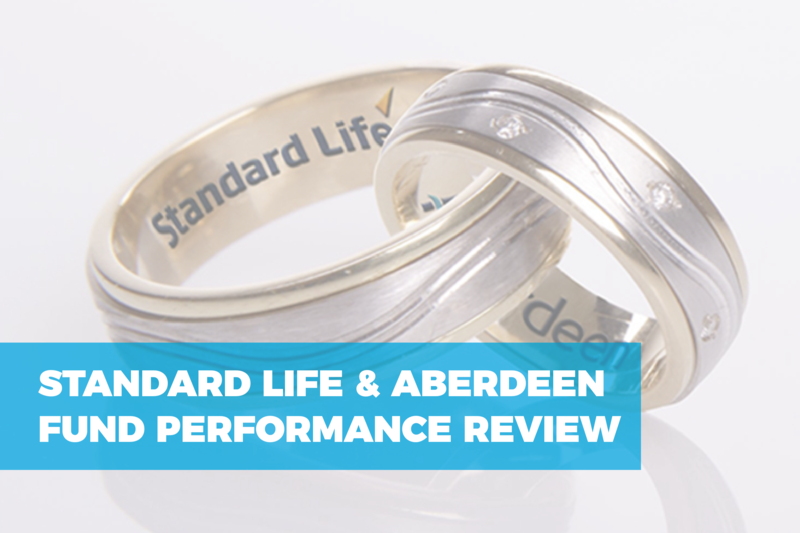 To identify the performance of both Standard Life or Aberdeen’s range of funds we reviewed their performance over the recent 1, 3 & 5 year periods and rated each fund based on how they performed in comparison to all other competing same sector funds. As identified in our analysis, both Standard Life and Aberdeen’s range of funds have been blighted by poor performance. From the 57 Standard Life funds that were analysed only 4 (7.0%) received a 5-star rating. Each of these 4 funds consistently outperformed at least 75% of competing same sector funds over the recent 1, 3 & 5 year periods. Standard Life’s best performing fund was the ‘Standard Life Global Smaller Companies’ fund. Over the recent 5 years this fund returned growth of 134.49% and it has persistently been one of the best funds in its entire sector and has outperformed at least 95% of same sector funds over the recent 5-years. Another Standard Life fund that has excelled is the ‘Standard Life UK Opportunities’ fund. This 5-star rated fund has regularly been among the best performers in its sector and over the recent 5-years it returned growth of 92.31% which was greater than 85% of competing funds. In total, 68 Aberdeen funds were analysed for performance. Only 4 or (5.9%) were awarded with a 5-star performance rating. One of their most impressive funds was the European Property Share fund, which returned growth of 83.88% over the recent 5-years were it consistently outperformed 90% of competing same sector funds. The ‘Aberdeen Global Select Euro High Yield Bond’ has also been a frequent top performer. This 5-star rated fund returned growth of 11.56% this past year even though it’s sector struggled with an average growth that was just 3.76%. Over 5-years its growth of 48.33% was also considerably greater than the sector average of 26.42%. 37 of the 57 Standard Life funds that were reviewed received a poor 1 to 2-star performance rating. Each of these funds have been among the worst performers in their entire sectors. One of the worst performers was the ‘Standard Life Global Equities’ fund which has consistently returned growth that was significantly lower than the sector average. Over the 12 months this fund was outperformed by 85% of funds in its sector and over 5-years it was outperformed by 76% of funds in its sector. Another Standard Life fund that has disappointed was their European Equity Unconstrained fund. Over the recent 12 months this fund returned growth of 11.24%, which not only was worse than 98% of competing funds but it was also notably lower than the sector average of 17.44%. 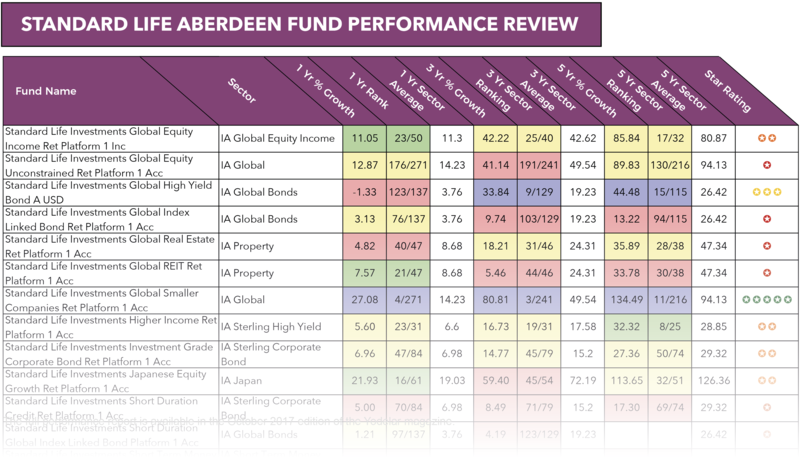 From the 68 Aberdeen funds analysed over 76% were provided with a poor 1-2 star performance rating. Among the Aberdeen funds with the worst performance was the ‘Aberdeen Global Asian Smaller Companies’ fund. This fund is one of the most popular in its sector and currently holds almost £1.5 billion of investor savings, but despite its popularity its performance has been poor. This fund has consistently struggled and over the recent 5-years it was outperformed by 97% of funds in its sector. However, over the past 12 months this fund has really struggled as it returned growth of just 13.39%. In comparison, the top performer within the same sector returned growth of 40.45% and the average growth within the sector was 23.89%. The ‘Aberdeen UK Equity Income’ fund has also struggled for competitive performance despite the UK Equity income sector enjoying record levels of growth. Over the recent 5-year period this fund returned growth of 39.82%, which was lower than 99% of funds in the same sector. investors’ confidence in their quality as a fund manager, the fact is, a large proportion of the funds managed by Standard Life and Aberdeen have consistently been poor. This raises concerns over whether Standard Life Aberdeen can provide investors with low cost and competitive investment options.